This traditional Greek spanakopita (spinach pie) is made with ready-made phyllo dough, plenty of spinach, lots of greens and herbs, crumbled feta cheese and olive oil. Bake it until golden crispy and enjoy it as a main course (makes a wonderful family friendly dish), starter or snack, any time of the day. You can find it everywhere in Greece but there is no spinach pie like this delicious and super crunchy homemade “spanakopita”! Begin by preparing the filling first. Place a large pan over high heat (7/9), sauté the spinach and leeks for 4’-5’ and add onion, spring onions until all liquids are soaked up using a couple of tablespoon of olive oil. No need to add any water as the greens release their own juices. Remove from heat and add the chopped parsley, dill, mint, the rest of olive oil, corn flour and sugar stirring well to combine. Crumble the feta cheese on top and season with salt and pepper before setting the filling aside (remember not to over season with salt as the feta is quite salty). Preheat the oven to 190°C. 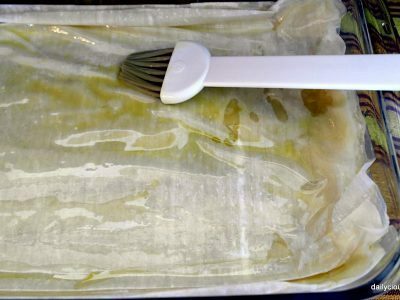 Grease slightly a rectangular baking dish (approximately 35 x 23 cm). Place 5-6 phyllo sheets folded into half (size of surface of baking dish), one on top of the other, brushing each one with olive oil. The quantity of olive oil should be enough for brushing all phyllo dough. After spreading half sheets, add the filling and spread nicely and evenly with the back of a spoon. Cover with the rest of the sheets, repeating the same process described previously. When all sheets are over, brush the surface of the spinach pie with the milk (or water) and score in square pieces with a sharp knife. Bake the traditional Greek spanakopita (spinach pie) for about 50-55’ in 190°C (upper and lower heating) or until crispy and golden brown. 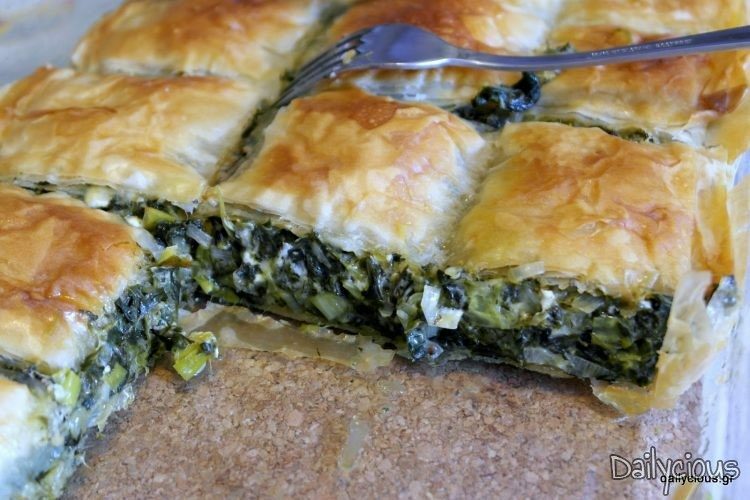 Leave the spanakopita to cool down for 10-15’ before cutting into pieces and enjoy it like Greeks do! Next day reheat the spanakopita in a toaster and get it all crunchy again.